Are you sick and tired of missing out on all those fun dinner parties that you always hear about? Well, worry not. We have just what you need to get into every dinner party from here on out. Think about it, what does every fancy food soirée need? Utensils to help devour the lovely feast spread out upon the table! Knives, spoons, and forks are found at just about any dinner party one could throw. 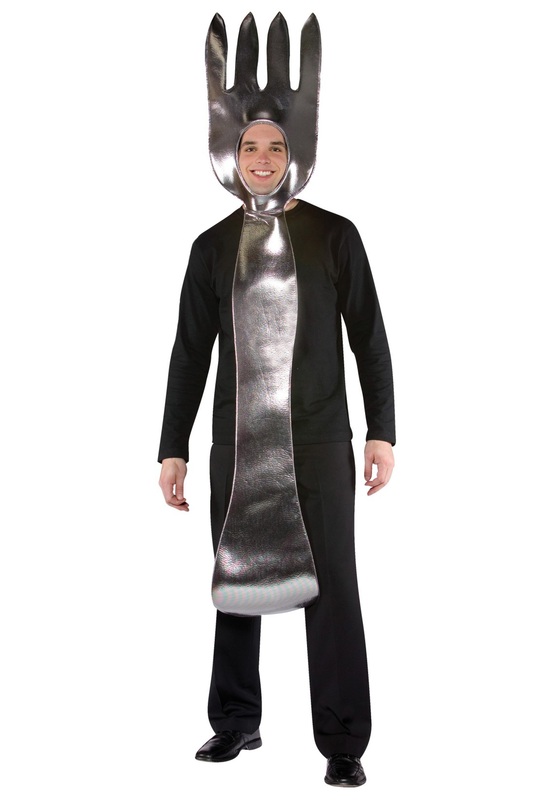 This Adult Fork Costume will enable you to sneak into any dinner party you want. Then after you ditch the shiny tunic to reveal your formal wear, you’ll blend right in! Now, if you’re not much for party crashing, we totally understand. This easy to assemble costume will be perfect for Halloween or any other costume parties you wish to attend. Simply throw on a black long sleeve shirt along with a matching black pair of pants, then add the oversized fork tunic and you’ll be all set to enjoy the party scene. Have your significant other or a friend dress up in our Spoon Costume and the two of you can go out as one of the most dynamic duos found at every dinner table. Just make sure that a dish doesn’t run off with your spoon… if you happen to see a cow jump over the moon, then keep your eyes peeled for those dirty spoon-snatching dishes! Now then, get your hands on this Adult Fork Costume and start crashing some dinner parties or enjoy a night full of Halloween festivities. Oh, and make sure not to get too wild on the dance floor, you wouldn’t want to poke anyone while you’re head banging!